Kelp is called a miracle plant because of its natural healing properties. Kelp is the best natural source of trace minerals available. Kelp is source of protein and rich in Iodine and Iron. 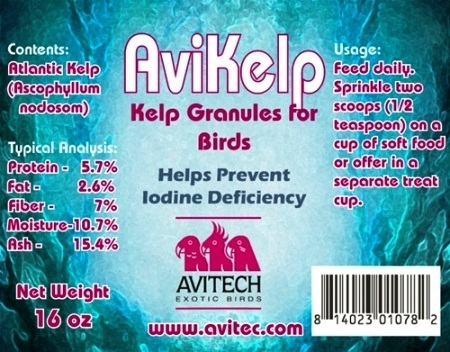 Wonderful natural iodine supplement for your birds to free feed on at will. Great for feathers and overall health. Often served as granules or a powder, I prefer the granules to the mess of powdered forms. My birds got the powder everywhere! I recommend and have it available for my lady gouldians at all times but especially during moult! Parents will readily load up and feed newly feathered chicks, so be sure it's full and clean with babies in the nest! And best of all - Beautiful Feathers!! !